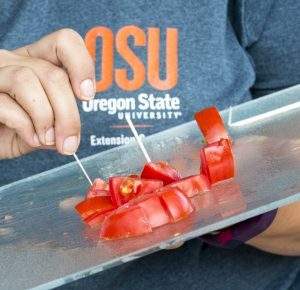 Amy Garrett, an Assistant Professor with OSU Extension’s small farms programs, is teaming up with producers across the Willamette Valley to examine possibilities for growing vegetables without irrigation. At a demonstration site at OSU she harvests melons, tomatoes, potatoes, dry beans, and squash, all grown without any supplemental irrigation. In 2016, Garrett added biochar amendments to existing dry-farming practices to determine if it could improve crop yield or quality. With some yield increases in certain varieties of melons, potato, and winter squash, she is interested in including biochar in future field trials especially on sites with less productive soil types. Dry farming uses the residual moisture in the soil from the rainy season instead of depending on irrigation. 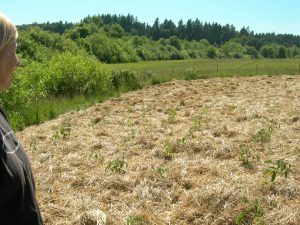 While dry farming is common practice in grain-producing regions of the interior PNW, it is far less prevalent among vegetable producers west of the Cascades. However, Garrett has found a handful of vegetable producers in Oregon and Northern California with extensive expertise in dry-farming, and is working to share and expand upon their experiences with other producers in the Willamette Valley. She says that while farmers can often expect lower yields without irrigation, dry farming can produce more flavorful vegetables. Dry farming provides an important option for farmers with limited or unreliable water rights, or for those interested in developing products they can specialty market. Dry farming works by bringing together multiple practices, including seed selection, soil preparation, and the timing and method of planning. Crop and variety selection is critical, and Garrett uses seed varieties that have been developed or tested specifically for dry farming by other producers. Dry farming also calls for deeper and earlier planting to access water when and where it is available. Plants are given greater spacing to reduce competition for water. Protecting the soil surface from evaporation is also critical to conserve moisture. While some dry-farming producers use extensive mulching to cover the soil, others leave the soil surface bare and use a practice called ‘dust mulching’. This entails repeated, shallow plowing to cultivate weeds and create a loose dry layer of surface soil, which is thought to disrupt wicking of moisture from depth. 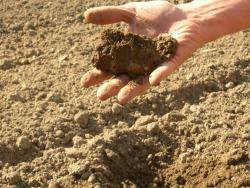 Soil properties are also important to success in dry farming, which is where biochar comes in. The best soils for dry farming are deep (4 feet or more), have high water retention, and are nutrient rich. Garrett hoped that applying biochar might help to increase soil water retention, and possibly improve soil nutrients too. 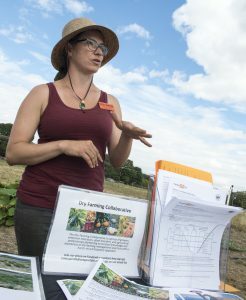 In addition to field trials conducted in collaboration with twenty Oregon farmers, for the last several years Garrett has been planting less formal demonstration plots at OSU’s Oak Center for Urban Horticulture. 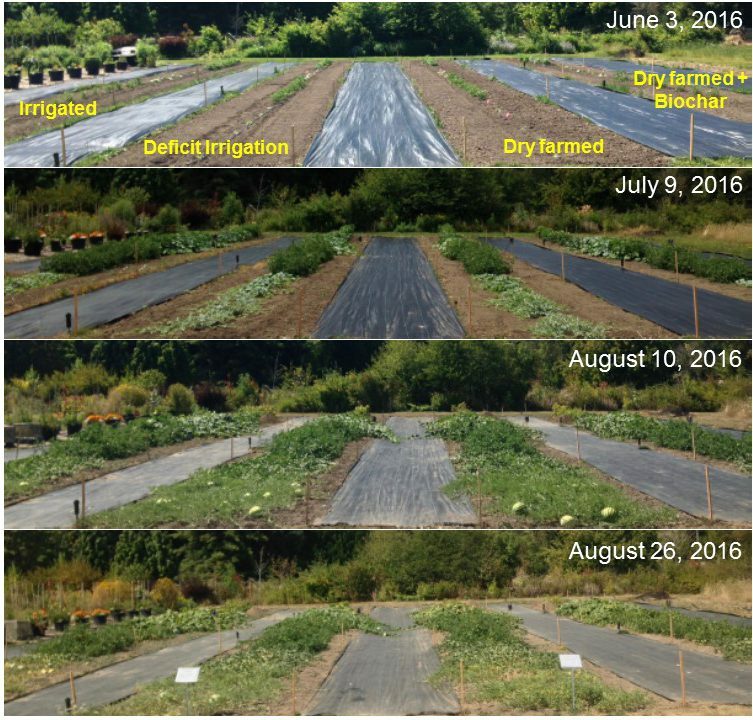 In 2016 she grew melons, tomatoes, squash, and potatoes to do side-by-side comparisons of four treatments: Irrigated, Deficit Irrigation (1/2 of full irrigation), Dry Farmed, and Dry Farmed with biochar compost. While the fully irrigated plot received 25 gallons of water over the growing season through drip nozzles , the deficit irrigation plot received only 12 gallons, and the dry farmed and biochar plots received no supplemental irrigation. All the plots received 2 inches of compost prior to planting, and the biochar plots also received 1.5 yards of bokashi biochar compost from BioLogical Solutions LLC. Diagram of crops and cultivars used in the dry farming demonstration. Two varieties of each crop were selected based on previous success in dry-farming systems. All the crops were grown from early May until the end of August, and were evaluated for yield at harvest. In addition, at the dry farming field day on August 9th, participants ranked dry farmed and irrigated tomatoes in the categories of color, texture, and sweetness. Note that treatments were not replicated, so results are from single plot observations. 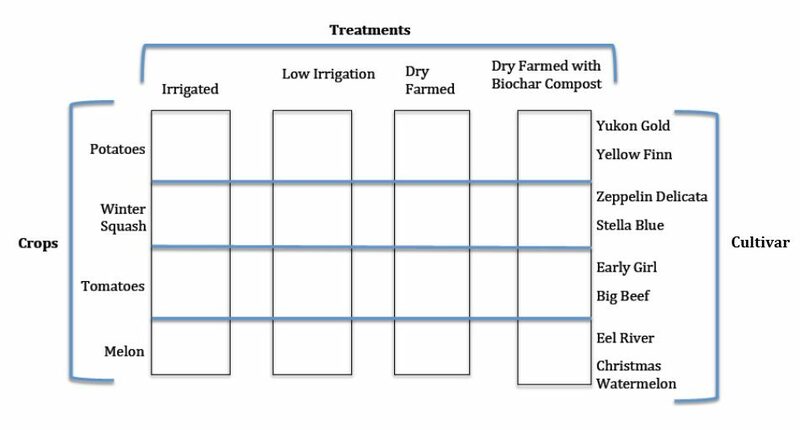 Crop growth through time in the four irrigation treatments. (Photos by A. Garrett). All of the reduced- and no-irrigation plots grew remarkably well. They remained green and productive through harvest. Several of the crops had similar or even higher yields in the low- and no-irrigation plots compared to full irrigation. 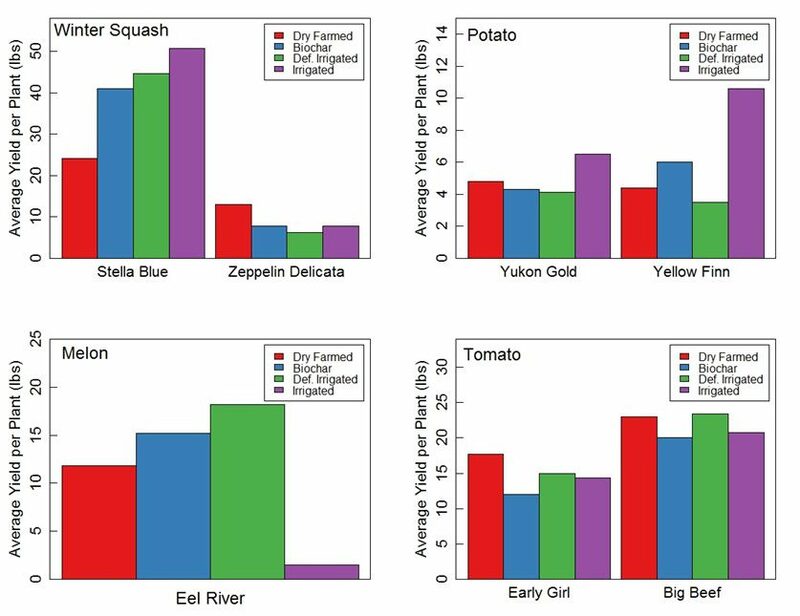 Sensory evaluations of tomato were similar for irrigated and non-irrigated “Early Girl” and “Big Beef” varieties. However, a third variety called “Jory” was much preferred when produced without irrigation. With respect to biochar benefits, results were mixed. For melon, winter squash, and potato, one variety of each crop had higher yields with biochar compared to regular dry farming. However, the other variety had similar or lower yields with biochar compared to no biochar. Both varieties of tomato had somewhat lower yields in the biochar plot. Yield results for dry farmed crops in the 2016 Oak Creek Demonstration. Garrett is still interested in experimenting further with biochar, and testing whether higher application rates or deeper incorporation may be ways to take advantage of the high water storage capacity of biochar. She is especially interested in trialing biochar on dry farm sites with shallow soil (less than 4 feet to restrictive layer) and/or less water holding capacity (e.g. Central Point Sandy Loam) as many growers are experimenting with dry farming in less than ideal conditions. Sensory evaluations gave high marks to tomatoes grown without irrigation. (Photo by Lynn Ketchum, OSU Extension).